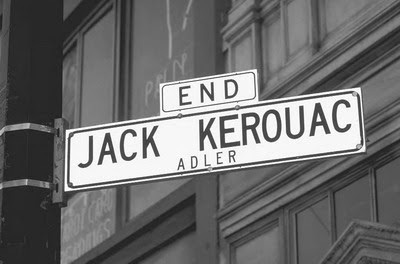 Jack Kerouac loved the people, the things of life, the rivers, his mother, and, he also loved jazz. He loved jazz with such intensity that most of us can’t even imagine. He tried to create what we say a jazz writing style, a bop writing style that is evident in his very fine poetry book, Mexico City Blues (1959). Here, in July, 1982, Sam Charters (born 1929) a novelist, blues and jazz historian, poet and the writer of Studies in Underground Poetry Since 1945, published in 1971 - and a groundbreaking work in the study of the Beats - remembers Jack Kerouac and his passion for jazz, while examining the influence of this music and certain jazz musician on his writings. According to Allen Ginsberg in an interview originally published in Composed on the Tongue (1980), Jack Kerouac “learned his line” listening to early bebop. He was a regular visitor at Minton’s club, the house of bebop and modern jazz. And it was Lester Young who gave Jack Kerouac his first Marijuana! Dizzy Gillespie’s improvisational style and innovative harmonies had a profound influence on him. Charlie Parker, a rhythmically complex, improvisational idiom influenced Kerouac’s spontaneous approach to prose writing. Jack Kerouac honors Charlie Parker in the final three choruses of Mexico City Blues, praising Parker’s musical genius, recognizing his human position, and appealing to Parker for prayer on behalf of Kerouac. Thelonious Monk undoubtedly had his most profound influence on Kerouac, who emulated the rhythmic and harmonic intricacies of bebop in his spontaneous prosody. Kerouac even organized a collaborative jazz-poetry performance on East 10th Street in Manhattan in early October 1957, and called it “First Poetry-Jazz Concert.” Originally the performance was intended for the Museum of Modern Art. This audio file includes personal comments and observations from Charters, poetry reading and reading passages from Kerouac books, plus playing some hot jazz and Kerouac’s own voice re-telling his history of Bebop. 84 minutes. *Sound drops at 00:50:00 for a couple of seconds. **Thanks to very generous David, from Isfahan, for sending the link. Listen to On the road: The Jack Kerouac conference, Sam Charters lecture, Jack and jazz, July, 1982. Great stuff. I'm researching my own essay on Kerouac and jazz... Hope it's as good as this. Great stuff! And I am grateful for this great recording which includes this great introduction to the underrated John Clellon Holmes!